It’s raining sale in the cyber world. Literally. In the space of last week or so we have witnessed two Cyber Sales in India. First out of the garage was the OMG Sale conducted by CitiBank India and soon followed GOSF or Google’s Great Online Shopping Festival. The OMG Sale was held on December 4th and 5th while GOSF went live from December 11th and will end on December 13th. E-Commerce portals have flourished in the recent past as Internet Shopping has become a bit of a rage. The fact that you can shop from the comfort of your home, have unlimited choices and can easily monitor the competitors pricing schemes without looking miserly are some of the reasons why Internet Shopping has getting quite popular. 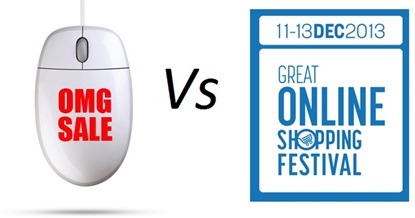 Since, OMGSale and GOSF target similar audience, the comparisons are bound to happen. While, GOSF is still going on and OMG Sale has ended, we decided to look at both these cyber shopping festivals more closely. Purely based on the scale, GOSF has is much larger higher number of e-tailers participating, whereas OMG Sale by Citibank was more focused. OMG Sale sale got few things right – Here are five points that we feel were the differentiators. 4 4. Where are the Google Deals? OMG Sale had a defined twitter handle (@OMG_Sale) that made sure the world of Twitter was informed about the sale. GOSF did not do that and all the communications were held directly from Google India account. Obviously, the Google India account would not moderate and go out and reply to each one of the tweets of people expressing grief or grievance of any kind. Whereas, OMG Sale folks were able to respond, if questions like this came up! #GOSF what happened to your site? OMG Sale was a collaboration of 24 partners. Each of them had exclusive deals, which were live for the two days, but the catch was that you needed a Citibank card to avail these deals. With GOSF, you have over 200 partners but the deals are either repetitive or are just regular deals of E-Com portals that have been pushed under the large hood of GOSF. Even worse, some deals showed on GOSF site had much less prices on products than what were available on the actual retailers site. If you go through the partner listing here you will see listing of the likes of Star Sports which simply are not even connected to the whole event, how many more such deals are there that are actually no deal? A tactic to simply boost the numbers? Your guess is as good as ours. Star Sports is listed as a participant on #GOSF but they have no deals, no mention on their website. Dummy? How many such sites? Definitely, GOSF needs to bring in more focus. The GOSF site has been giving issues to the users by either not responding at all or being snail slow. OMG Sale did not have this issue, because firstly they did it on smaller scale, and probably anticipated the kind of traffic they would get. The site is the main asset in festivals such as these and one definitely expected a lot more from the likes of Google when it comes to getting their web development right. More so, people are left clueless, as there is no official medium of communication, no Twitter Handle and no site to fall upon. 4. Where are the Google Deals? The first thing you would associate with a Google Sale is a discount on millions of apps in the Google Play Store or maybe even a healthy discount on some of the Nexus Devices, be it Nexus 4, 5 or even 7. However, none of that is happening and that is disappointing. The techies in us love Android and love the Nexus range of products and it was rather sad not to see any of the GOSF offers on the Google Play Store. We alluded to this point a little in point 2 but feel it deserves a mention of it’s own. Some of the deals in GOSF simply are there to deceive the user in the name of providing big discounts. For example, on SnapDeal the iPhone 5c is originally listed at Rs. 53500, which is simply not true cause that is the price of the iPhone 5s. The 5c without any deal anywhere has been listed for Rs. 41,900. However, to make things look interesting and throw a big number as percentage off, Snapdeal has decided to increased the MOP of the product which is like throwing dust into the eyes of the consumers. This is in no way to criticize or demean what Google is doing at GOSF. We love the idea of Cyber Sale and would love them become what Black Friday and Cyber Monday are in the US. However, there is always lessons that one can learn from another. No doubt GOSF is on a much larger scale as compared to OMG Sale, but you have to say, OMG Sale approach looked more organized and had quality, while Google focused on quantity.